Rapid Module Evaluation: The boards allow the performance of the Linx HumRC� Series modules to be evaluated quickly in a user�s environment. 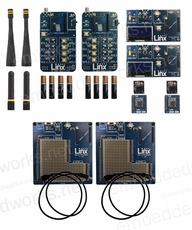 The development boards can be used to evaluate the range performance of the modules. Application Development: A prototyping board allows the development of custom circuits directly on the board. All signal lines are available on headers for easy access. Software Development: A programming dock with a PC interface allows development and testing of custom software applications for control of the module. Design Benchmark: The boards provide a known benchmark against which the performance of a custom design may be judged. 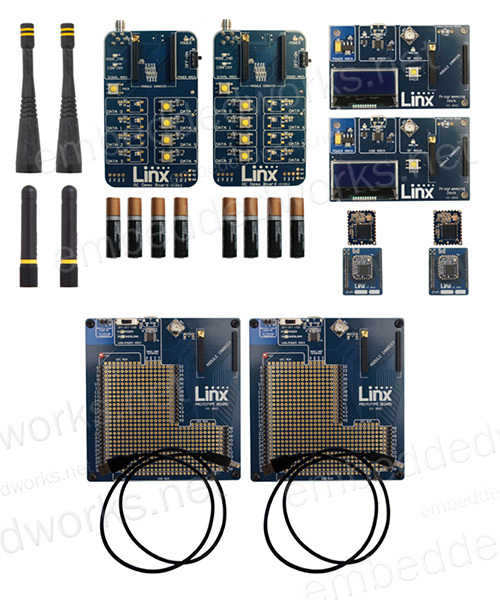 The Master Development System includes 2 Carrier Boards, 2 RC Demo Boards, 2 Programming Dock Boards, 2 Prototype Boards 4 HumRC� Series transceivers*, antennas, batteries and full documentation.